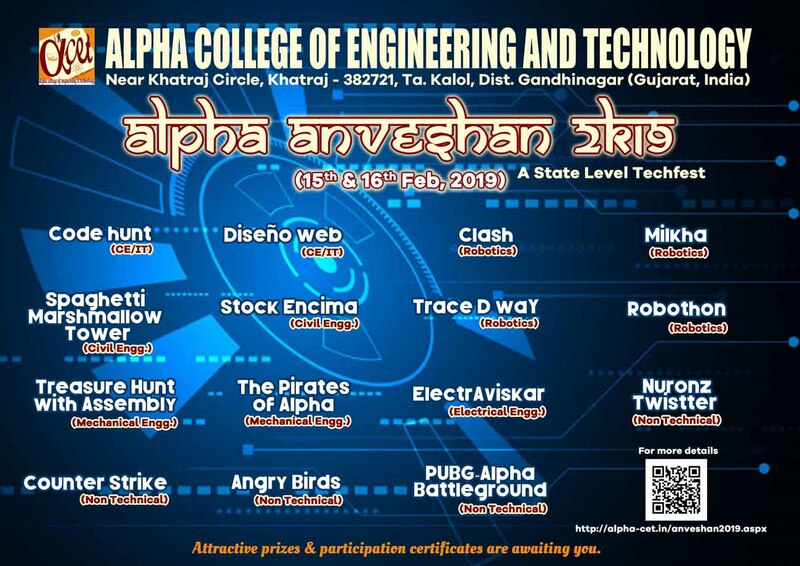 Alpha College of Engineering and Technology is organizing a technical event ‘Alpha Anveshan 2k19’ for all the students of degree and diploma engineering, on 18th & 19th Feb, 2019. The event will definitely boost students' competence for innovative thinking and will help them put-forth their ideologies aligning with real world situations. Not only that, this platform would assist the students in their career with the right set of techno-managerial skills and nourish their knowledge in every possible manner. This even would help the students to explore the wider horizon of the competitive advanced world. The participant has to complete test within the time limit. In this event a written test is conducted with set of 20 questions related to HTML and CSS. language and a time limit of 30 min is given and the participant has to complete the test within the time limit. Depending upon their performance they are selected to the further rounds. Maximum 2 members per group. Students have to design a website on any one of the specified topics and present it to the judges. First page must be your Homepage (Containing LOGO/picture depicting the topic and the website name). Three pages must be dedicated to your discussion suitable for the website. The last page must be Information Hub that provides details about. Use of personal Laptop or equipment for designing is prohibited. Use of USB drive is strictly prohibited. Books and mobile phones are not allowed in lab. All kits and materials are provided by Event Management. All decision of judge & event coordinators shall be treated as final & binding to all. Individual or team of maximum 3 students will be allowed. Participants shortlisted from round 1 and 2 will be competing in final round. All participants should bring receipt of registration and valid college identity card. To know and find out given component/device. In this round, Component & device is given to participants. they will identify and describe it with their knowledge. To design robot on paper and describe components with specification. In this round, sort listed participants of round 1 will be allowed. They will design robot on given drawing sheet and they will give list of component used in robot with specifications. To make line follower robot. Build robust manual robots that can outlive the rocky, Topsy-turfy terrain accept the challenge, strike the crags, endure the obstacles and reach the TOP. There will be Some Surprise Obstacles As Well to be Disclosed On the Spot. Final Round will have more Complex Obstacles. Robots do not abide by the above specifications/ regulations are not allowed to play. If violations are detected during the running game, the team will be disqualified for that game. If violations occur repeatedly, the team can be disqualified from the tournament. Coordinators’ decision would be final regarding all the issues. Design a manual robot which is capable to fight with opponent in the arena and the destruction is the only to show power. Here the bot who show the power will be king of arena. Every team must have a “UNIQUE NAME”. Maximum 4 members in a team, and minimum 2 members. All Team Members are allowed in the ARENA. The team will not get any time for practicing in the ARENA. In case both the robots remain mobile after the end of the match, then the winner will be decided subjectively. If a robot is thrown out of the arena, the match will stop immediately, and the robot which is inside the arena will automatically be declared as the winner. For the final and semi-final match, the rules will be decided by the organizers. The total machine weight with battery should not more than 20 kg and not less than 3 kg. Use of readymade Toy/Lego kits is prohibited, but one can use the readymade trans-receiver pair. Use of autonomous robot is not allowed. If rules are not followed, then the team will be disqualified. Circuit jammers, chemicals, compressed gases and rockets, fuels, combustion power methods etc., use of I.C. engines is prohibited, some special weapons are arranged on the arena to damage the bot. Qualifying Round may have the Obstacles like Rough Terrain Track - Bumps - Slope - Nail-Bed - Bridge - Water puddle-Stones - Oil / Grease, etc. There will be some surprise obstacles as well to be disclosed on the spot. The robot should fit of dimension 300mm x 300mm x 250mm (lxbxh) for wireless and wired robot. The wired robots should have at least 3m long wire. Output of connected power packs used by a robot cannot exceed 12 volts. The team may consist of maximum 4 members and minimum 2 members. Every team must have a unique name. Only 2 members are allowed on track. There will be 2 teams playing in this event. If any team is not available within 5 minutes after the announcement of the team, they will be disqualified and the opponent will proceed to next level. There will be three hand touch allowed and extra five second will be added for each hand touch. Robots not abided by the above specifications/ regulations are not allowed to play. If violations are detected during the running game, the team will be straight away disqualified for that game. Event Coordinators’ decision would be final regarding all the issues. Out of the total teams, top sixteen will be selected on the basis of minimum time taken to complete the track. Selected teams will play knockout racing match. Surface of the racing track will use base material suitable for racing such as a flex banner. If a Robot leaves the line, and has not crossed the finishing line, it will be considered to have gone off the track, and that run shall be invalid. The Robot has to follow the line and complete the Track in least possible time. Winners will be decided based upon the scores with minimum number of penalties made. Ready-made Robots are not allowed and will lead to Disqualifications. The final decisions lies in the hands of managers, any unnecessary arguments may lead to disqualification of a whole team. If you have questions or concerns, talk to your instructor before proceeding! Except for the battery pack, the handler shall not make any addition, removal, replacement or change to the hardware of a Line Follower during a contest. It is however permissible to make minor repairs. The participants have to ensure that room lighting, photography, etc. does not affect the functioning of the sensors. To be a pirate you need a Destroyer Boat, and with the help of it, pirate will steal points by puncturing balloons. You need to reach to ballons with help of your Destroyer Boat and then you have to puncture balloons with help of some extra assembly attached with your own Destroyer Boat. Eligibility of each team is liable to availability of College identity card of all members. Each team is required to prepare a Destroyer Boat (of wood or thermocole) on their own which would puncture balloons floating on the pool of water. The first round will be a drag race. All the teams will be required to float their boats one by one, from the starting pit to the other end of the water pool with in minimum possible time. To attain minimum time the teams can remove extra attachments from their boat. Team taking minimum time will be the winner. The teams will be required to float the plastic balls from the pool into the starting pit with the help of some attachments into their boats. Team carrying maximum balls into the pit in a given time will be the winner. In this round the teams will be required to puncture the balloons floating into the pool with the help of some pins fitted on the boats. In place of pins, some other mechanism can also be used to puncture the balloons. The team puncturing maximum number of balloons in a given time will be the winner. Nuronz Twistter is mind and analytic power testing quiz competition. In this event team of two member have to register (not more not less). Every team member have to first pass through the screening round in which student have been given a objective paper with 4 multiple choice question in it. Student has to come with blue pen and any written material and electronic device is not allowed throughout the competition. Result of the first round will be given after 1 hour of the completion of exam. Certificate is not provided to any one. Participant will have to answer the Question in 2 minutes. This round consists of 12 audio Questions. The Participant should press buzzer after hearing the whole question. The question will be based on GK and quantitative. Each team cannot pass more than 5 questions. This Round consists of vocabulary questions. In this round 1 member from the team will have to act and explain the word given to another member of the team. Stock Encima is the event to prepare different elevated water tank structures by using given materials. The dimensions of base and height of structure is given below. Students have to prepare the water tank as per the given criteria using given materials. Two hundred and fifty ice cream sticks will be given to every group. No other material will be allowed for preparing structure. If found, team will be disqualified. Final results will be based on judging criteria. The more water stored in tank, higher will be the score. The more height of total water tank, higher will be the score. The less the weight of structure, higher will be the score. The prepared structure will be placed on shake table to check its stability. The less damage structure have on higher frequency, the more marks will be given to the team. This event is designed to judge the technical and intellectual ability of students. This event consists of finding the different parts using intellectual ability and assembles those parts using technical ability. Qualification will be based on time required for assembly. This stage is about hunting the different components of the same machine. A limited time will be alloted to all the teams to find all the hidden parts. This stage is about assembling all the parts hunted down during 2nd stage. Team finishing assembling parts fastest along with time required for finding those part and penalty (if any) will be winner of the competition. (total time = time required for finding parts + penalty time + assembly time). Other rules, if any, will be specified before event. Individual or team of maximum 5 students will be allowed. Maximum: 5 students per team. No other material will be allowed for preparing structure, if other material found than team will be disqualified. The shape, height and view of the structure will depend on participants. You will have only 30 minutes to prepare the structure. The students group will have to again build the free standing structure from spaghetti for which 4 Nos of marshmallow will be provided to make joints. A platform of 8 cm X 8 cm needs to be built at the top to support weights. Tallest structure supporting highest weight will be awarded maximum points. Minimum height of structure should be at least 45 cm. You cannot use any other materials to assist in the support of your tower. Teams are free to break spaghetti as well as marshmallow. For Round 2 Team should build tall structure as per instructions provided above will be tested by putting weights on the platform on the top of structure prepared by you. More the height and load carrying capacity of structure, higher will be the score. Maximum base size for the tower in both the stages should be 45 cm X 45cm. Any individual can play the game. No. certificate will be provided. This game consists of three different levels. Level-1 is worth 30 points, level-2 is worth 60 points + bonus point and level-3 is worth 100 points + star points. In every Level participate got three shoot outs. In this Level there are five pigs arranged on the boxes and the participate must shoot out at least three of them in order to go to the next level. In this Level there are eight pigs arranged on the boxes and the participate must shoot out at least five of them in order to go to the last level. If the participate shoot all the five pigs in first trial then they got Bonus of 20 points and in second trial they got Bonus of 10 points. In level-3 there are twelve pigs arranged on the boxes and the participate must shoot out atleast eight of them to complete that level. During this Level participate has also a chance to score STAR points of 50 points. The sum of all three different level points will be considered as a winner. The Half-Life Counter-Strike PC game championship 5x5 (team play, 5 members per team). This event is only for PUBG- Mobile (desktop or laptop game will not be allowed). Map is ERANGEL classic mode. Cumulative points of all those 4 rounds will be counted to prepare result. 5 teams winning preliminary round will be selected for semifinals. All matches will be in squad mode. Teams must register with 4 members with no substitutes. Players will have to use their own internet connectivity. Others rule, if any, will be specified before event.